For more than 170 years, Dallas has tried to turn the River into something it isn’t. Thankfully, the grand ambitions and failed attempts of our forebears show a way forward. No one said a word about the toll road during Mayor Mike Rawlings’ landmark announcement. Instead, all eyes were on the check. To be fair, it was a big one: $10 million—a down payment on an eventual $50 million donation—made out to the nonprofit Trinity Trust and signed by Annette Simmons, widow of the late billionaire and corporate raider Harold Simmons. The local TV news cameraman got a shot of the little light-blue slip of paper and its long string of zeros, as the Trinity River Project champions gathered around to congratulate each other. After more than two decades, the gift held a promise, the mayor assured them, of finally bringing the question of the Trinity River to a close. It was a bright and warm October morning, Halloween. Through floor-to-ceiling windows overlooking downtown, you could see a swath of the Trinity River floodway and its levees, the canvas upon which this latest vision, “the Van Valkenburgh plan,” named after its author, renowned urban designer Michael Van Valkenburgh, would be painted. Over the following weeks and months, national media would run with the story as if it were a fait accompli. “Dallas is getting an urban park 11 times as large as Central Park,” proclaimed one headline. The stories, each accompanied by the same lush Van Valkenburgh rendering, proved ideal Facebook fodder in North Texas. Could it be true, after decades of planning, after burning through vast quantities of political capital and thousands of public employee man-hours and millions upon millions of public and private dollars, that Dallas would finally build its park in the Trinity River floodway thanks to this new donation? If there was reason to doubt the political theater, it sprang from the toll road’s omission. After all, questions about the road—funding problems, engineering complications, political opposition, its negligible projected impact on traffic downtown—have kept the park from being built for nearly 20 years. Ever since Dallas voters approved a 1998 bond package that wrapped up the road and the park, both have existed only as renderings and watercolors. Texas Flood: When the river rose in 2015 (above), thousands of people came out to see the spectacle. But when the waters receded, tons of silt were deposited on paths and parking lots (below). Any new park would need to be hardy enough to withstand cycles of flooding. Photo by Tim Rogers. Through those big windows, you could see some of the fruits of this long effort. The Santiago Calatrava-designed Margaret Hunt Hill Bridge. A second Calatrava suspension bridge, the Margaret McDermott, was rising over I-30. The Ronald Kirk Pedestrian Bridge. 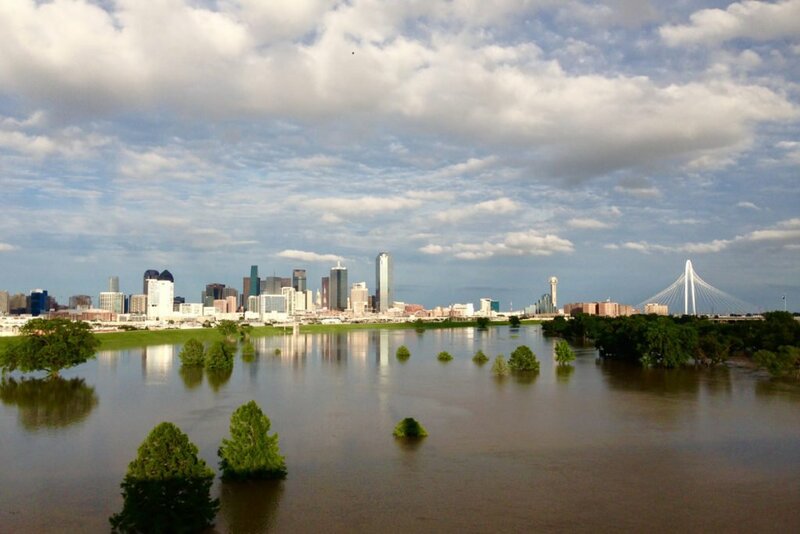 But what was difficult to see from the conference room that morning was the Trinity River itself, the trickle in a ditch, dwarfed by the city skyline and the scale of its own floodway. For some 170 years, Dallas has tried to come to terms with that river. What should Dallas do with it? How can we control it? How can we protect ourselves from it? How can we make the Trinity serve the city’s civic ambitions? Almost since the city’s founding, that sorry, stinky, muddy waterway has been fought over, managed, manipulated, worked, dug out, moved, derided, extolled, dismissed, or championed. Was the Van Valkenburgh park plan finally the answer? Photo courtesy of Kevin Sloane. 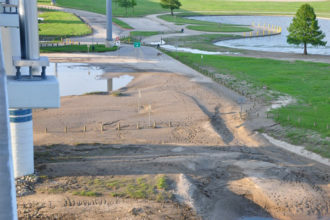 Or is the city’s failure for so many years to build a park an indication that Dallas has never come to terms with a bigger question about the Trinity River, a question that has bedeviled this city since the day John Neely Bryan settled along the river’s banks? That question: what does the Trinity River itself want? Dallas has long prided itself on the notion that it is a city with no real reason to exist. It has no harbor, no natural resources. According to the myth, Dallas sprang up from the barren prairie through an act of sheer, willful entrepreneurial gumption, like the Pegasus springing forth from the poison of Medusa’s decapitated head, rising at its birth toward the promise of heaven. The reality, however, is that when Bryan visited the area in 1839 with hopes of setting up a trading post in the new Texas Republic, he carefully selected his site on the Trinity River. The spot had two major land routes running through it, routes that followed the ancient network of paths blazed by the Caddo, Wichita, and Bidais tribes, which themselves owed their organization, roughly, to the network of streams, creeks, and river branches that feed the Trinity River watershed. By 1841, when Bryan returned to set up his post, Sam Houston had negotiated a treaty with the native tribes, driving half of Bryan’s projected clientele from their ancestral lands. Bryan pivoted. He founded a city instead of a trading post and became its first postmaster and store owner, also running a Trinity River ferry crossing near the current site of the Commerce Street Bridge. In his 1979 book Merchant Princes, Leon Harris describes Bryan as “the first in a long line of expert promoters reluctant to use hyperbole if an outright lie might prove more effective.” You might also call him the godfather of the public-private partnership. Bryan helped organize Dallas County, ensuring his city became its county seat by donating his private land for the courthouse. He understood that the river was both a key to Dallas’ success and its biggest threat, organizing the Dallas Bridge Company, which constructed the first iron bridge across the Trinity. From Dallas’ earliest days, civic leaders attempted to change the river. In the 1840s, they tried to convince Congress to fund a deepening of the river to make it navigable for large boats. In 1852, Congress commissioned a survey of the river, and in 1854 a steamboat sailed from the Gulf of Mexico to within 40 miles of Dallas. But the dream of turning Dallas into a port remained elusive, as the river had other plans. There were major floods in 1844, 1866, 1871, and 1890. After the flood of 1890, Dallas’ business leaders formed the Trinity River Navigation and Improvement Company to again convince Congress to appropriate money to transform the Trinity into a navigable waterway. City boosters commissioned Paul Giraud, an artist and secretary of the Commercial Club of Dallas, to illustrate a bold future for the Trinity River. Giraud’s rendering depicted steamboats and barges sailing up a widened river with a turning basin, with parks and pavilions crowded up against its banks. The boosters purchased a steamboat, the H.A. Harvey Jr., which set off from the Gulf of Mexico 40 years after the first attempt to steam up to Dallas. After an almost 700-mile journey that took two months and 10 days, the H.A. Harvey Jr. arrived at Commerce Street. “The dead river has been vitalized by Dallas enterprise and capital,” the Dallas Morning News proclaimed. The effort helped convince Congress to spend $2 million over two decades (with inflation, more than $50 million) on locks and dams along the river. But when it came to pitching Congress on investing in the Trinity River, no steamboat showmanship could rival the power of the river itself. The spring of 1908 brought a torrent of rain and the Trinity swelled to a depth of 52.6 feet and a width of 1.5 miles. Witnesses described sheds and outhouses being swept downstream along with dead cattle, horses, and pigs. In West Dallas, residents sat on their rooftops in their bedclothes, waiting for rescue boats. The Texas & Pacific railroad trestle was washed away, killing 11 people. Four thousand citizens were left homeless. There was no power for three days. All telephone and telegraph service went down, and rail service was suspended. The estimated cost of the damage was $2.5 million (more than $63 million in today’s dollars). George Kessler viewed the Trinity River as both an obstacle and an opportunity. He proposed moving it away from downtown. The river, he said, could become a harbor for a new inland port. The disaster was an embarrassment for young, up-and-coming Dallas, and the Chamber of Commerce swung into action. In 1909, the chamber established the City Plan and Improvement League, which invited city planner George Kessler to come to Dallas and propose fixes. When Kessler arrived in Dallas, he found a messy tangle of streets, railroad tracks, depots, and disconnected neighborhoods, the result not of careful city planning but of growth driven by opportunist land speculation. Kessler, like Bryan, viewed the Trinity River as both an obstacle and an opportunity. He proposed moving the river away from downtown and confining it within levees. The river, he said, could become “the center of a great city,” a harbor for a new inland port. Dallas’ business leaders marched back to Congress once again and secured $20 million for the project (more than $230 million with inflation). Then World War I broke out, and much of Kessler’s plan for Dallas was never implemented. Through the 1920s, levees were constructed in various locations along the floodway, but it wouldn’t be until 1925 that yet another consortium of business leaders mustered the political will to move the river and build a 13-mile levee system that matched Kessler’s vision. The next two decades of construction made some men rich. The area where the Trinity River once flowed became known as the Trinity Industrial District (later renamed the Design District), and from the Trinity’s muddy bottoms John Stemmons and his real estate man, Trammell Crow, went on to build what was by the 1980s the largest real estate company in the world. City leaders had proven that the Trinity could create fortunes, and they clung to dreams of transforming it into a shipping canal. Through the 1930s and 1940s, a succession of private business groups advanced the effort. The Trinity River Canal Association became the Trinity Improvement Association, which lobbied the Texas Legislature to create the Trinity River Authority, a statewide organization that drew many of its board from business associations. Dams and reservoirs built by the Trinity River Authority for flood control and drinking water also had the intent of regulating the river to allow for navigation. In 1963, the U.S. Army Corps of Engineers approved a plan to transform the Trinity into a shipping canal; and in 1965, President Lyndon B. Johnson backed legislation that authorized the Trinity River Project, a $1 billion effort (with inflation, more than $7.5 billion) to construct a 300-mile barge canal that would connect Dallas to the Gulf of Mexico. By the end of the 1960s, the shipping canal project looked like a done deal. But outside of the city’s close-knit business circles, opposition to the project grew. One warning sign came in 1972, when former mayor Earle Cabell, who had won his congressional seat by promising to bring a canal to Dallas, was upset by a young Republican named Alan Steelman who dared to openly question the project. Then, when the city placed a referendum on a ballot in 1973 to raise property taxes to fund the canal, boosters ran into another bold opponent, a Philadelphia-born trial lawyer and environmentalist named Ned Fritz. When Fritz moved to Dallas to get his law degree at SMU, he discovered something that many of the city’s native sons never bothered to notice. South of downtown, the Trinity River cut a course through a landscape of untouched prairie and thick hardwood forests that harbored an abundance of wildlife and served as a major migratory path for hundreds of species of birds. Fritz also saw the devastation that a century of economic growth had ravaged on the landscape. Dallas had discovered that it did possess a natural resource after all. Sand and gravel buried in the Trinity bottomlands was mined to make the concrete for the highways that fed the region’s northward sprawl. By the 1970s, many of these empty mine pits had been transformed into open-air trash dumps, which wreaked havoc on both the natural landscape and the largely segregated African-American neighborhoods south of the Trinity. The idea of turning the Trinity River into a shipping channel had become such dogma that few believed it could be defeated at the ballot box. But in 1973 turnout was massive, and 56 percent voted against the canal. Fritz and his environmentalists had managed to bury a scheme that had nagged the city for more than 80 years. Over the next two decades, the river flowed without much threat of interference. In 1983, the Texas State Legislature designated a huge portion of the Trinity watershed in southern Dallas as the Trinity River State Park. But a lack of funding and difficulty coordinating with the Corps of Engineers and the city led the state to abandon the park idea in the mid-1990s. Around the same time, though, a rebooted Trinity River Project emerged. When Ned Fritz moved to Dallas to get his law degree at SMU, he discovered something that many native sons had never noticed: a landscape of untouched prairie and thick hardwood forests. In 1995, a new consortium of Dallas businessmen and boosters formed the Trinity River Corridor Citizens Committee. On paper, their Trinity River Corridor Plan looked like a distant relative of the Trinity River projects of old. The canal, turning basins, and barges had given way to recreational lakes, whitewater kayak courses, athletic fields, and grand promenades overlooking signature bridges. Still, much of the spirit of the old Trinity projects remained. The new Trinity project would provide recreation, flood control, and a means to metaphorically stitch back together the city’s northern and southern halves. And, as always, it promised a boost to the local economy—only this time, instead of a canal, economic growth would be driven by a toll road constructed in the floodway. $246 million Trinity River Project bond package to put to the voters. Critics questioned the feasibility of the funding plan, worried about the impact of a floodway-bound highway, and challenged the influence of the construction lobby and Trinity-area landowners on the shape of the project. When Ned Fritz, then 80 and in ill health, tried to stand up and speak out against it at a community meeting, a PR representative working for the Trinity effort took him gently by the arm and sat him back down. The city boosters, led by a dynamic mayor, Ron Kirk, who pitched the plan as a boon for southern Dallas development, wouldn’t allow a repeat of 1973. The $246 million Trinity bond measure passed with 51 percent of the vote. Rather than a new park, however, the 1998 bond election ushered in two decades of infighting, bureaucratic negligence, shifting political priorities, and privately backed pet projects. All the while, tens of millions of city bond dollars seemingly evaporated. In 2003, under Mayor Laura Miller, the Trinity River Corridor Plan was renegotiated as the Balanced Vision Plan to place more emphasis on the recreational aspects rather than the toll road. In 2007, then councilwoman Angela Hunt led a failed referendum campaign to remove the toll road from the project altogether. The paradoxical nature of the modern iteration of the Trinity River Project, and the lengths to which its backers were driven to see it built, is best illustrated by then Sen. Kay Bailey Hutchison. In 2010, to realize this grand vision of a natural landscape, she tacked language onto an appropriations bill that made the Trinity River and its floodway the only waterway in the country exempt from federal environmental protections of wildlife and waterfowl refuges, parklands, and historic sites. When Rawlings took office, in 2011, and it came his turn to pick up the Trinity football, the plan had evolved into the kind of mishmash that Kessler encountered when he observed Dallas in 1910—a river and floodway shaped not by a coherent vision but by the conglomeration of dozens of opportunistic gambits. To rescue the effort, in 2014, the mayor deployed a supersize version of the old Dallas strategy. He secured another big check from a philanthropist and hired not one but 12 of the best urban planners in the nation to sort out the Trinity’s problems. Their main priority was to re-imagine the design of the Trinity Toll Road, which had, after a decade of engineering and federal approval processes, evolved into a multilane superhighway with connecting ramps that brought cars over the levee at the expense of acres and acres of land. 1892: An Impossible Barge Canal. Photo courtesy of the Dallas Public Library. 2016: Simply Impossible. Bad Idea After Bad Idea: An 1892 vision for an improved Trinity River including an island and riverfront amusements. The image was part of a push by city boosters to get Congress to pay for the deepening of the river so that it could be used as a barge canal. The most recent plan addresses just 1 mile of the river and is just as fanciful. Photo courtesy of the Trinity Trust Foundation. In late December, I meet Mayor Rawlings in his office on the fifth floor of I.M. Pei’s futuristic, fortress-like City Hall. When it opened, in 1978, the building’s cantilevered north-facing orientation was emblematic of a city with a single-minded strategy for expansion. Many of Rawlings’ predecessors were invested in industries—real estate, banking, chain restaurants—that made fortunes off North Texas’ postwar suburban sprawl. After Rawlings took office, the former Pizza Hut CEO made it clear he wanted to focus on southern Dallas, which, inevitably, meant figuring out how to deal with the Trinity River. Rawlings comes across as an affable, levelheaded, and optimistic, if pragmatic, thinker. As mayor, he hasn’t appeared comfortable with the politicking that comes with the position, maintaining his CEO’s impatience and a desire to move quickly from impetus to action. He has managed to extend the mayor’s relatively weak role in Dallas affairs (like the 14 council members, he only has one vote at the horseshoe) by using the bully pulpit to raise private funds to push his various initiatives. That’s why he holds such confidence in the latest Trinity concept. Fund it privately, manage it privately, and the citizens might finally get the best version of the park they were promised in 1998. 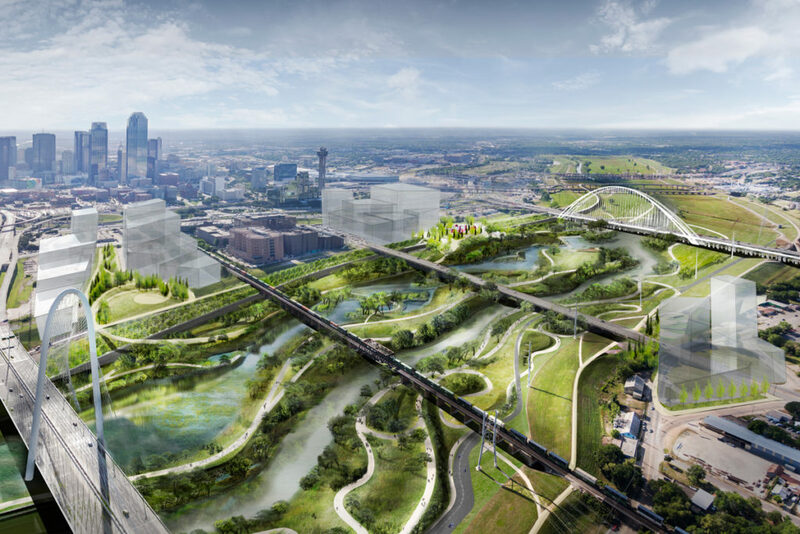 Rawlings’ so-called Dream Team of designers produced new renderings that replaced the massive toll road with a pastoral vision of a meandering parkway that winds through an admittedly stunning Trinity floodway re-imagined by Michael Van Valkenburgh. However, since the Halloween unveiling of the $10 million check, several more pressing crises have distracted the mayor, including an insolvent police and fire pension that threatens to bankrupt the city and a stalled bond election that must include almost $1 billion just to get the streets up to par. Pouring hundreds of millions into a park project between the levees may not feel like a priority, but in Dallas, the Trinity River is always a priority. Confidence and optimism aside, there are, however, still many unanswered questions about the Van Valkenburgh plan. No formal engineering work has been completed, and so while its authors insist that the design can be built without triggering a restart of the federal environmental approval process, neither city staff nor the Corps of Engineers can confirm that. Then there is the matter of cost. The mayor has asked planning consultants working on the project to “true up” the estimated $250 million price tag. But even if that number remains ballpark, it is enough to pay for only a portion of the design depicted in Van Valkenburgh’s models and drawings. The full cost, including re-bending the unnaturally straight river, will be twice that. That means Rawlings believes he can raise privately more money than was contained in the entire 1998 Trinity bond package in order to reconstruct the portion of the Trinity that stretches between the Ronald Kirk Pedestrian Bridge and the Margaret McDermott Bridge at I-30. None of this, however, fazes Rawlings. After all, his approach to the Trinity—raise money, tap a private entity to spend it—has scored what he sees as one of the biggest Trinity wins in a decade, the development of a private golf course on a former dump in the Trinity Forest that will host the Byron Nelson Championship next year. During our conversation, we walk to an adjacent conference room to look at a large illustration of the Trinity River Project that hangs on the wall. The concept is clearly out of date, and it is not clear which plan the image comes from. Looking at it, I’m struck not only by the number of amenities that the city once told voters it could put in the floodway that will never be built—water mazes, grand promenades re-connecting downtown Dallas to the waterway that once menaced it—but also by the sheer scale of the floodway, from south of downtown to where the elm and west forks of the Trinity meet, 8 miles northwest, on the Irving border. Even if the mayor is successful in raising his $250 million, most of that acreage will remain as it is today, unless billions are raised to construct future stages. This question of scale sticks with me. After more than a century of plans for the Trinity, somehow the river continues to frustrate Dallas’ outsize ambition. Maybe that’s because the obstacles that stand in its way have never been questions of money, politics, or design. Despite the city’s pride in its grand ambition—even the value it sees in the Trinity, “the largest urban park in the nation,” is connected to size—the scale of the Trinity River watershed continues to defy the capacity of Dallas’ collective civic imagination. On a cool January morning, I pull my car into a driveway at the end of Pemberton Hill Road, in southeast Dallas. On the locked gate there is a sign that reads Big Spring Preserve, and through it I can see an edge of the Great Trinity Forest about 100 feet or so in the distance. A 2008 Toyota Yaris pulls up behind me, and Tim Dalbey, a 70-year-old archaeologist, gets out. Dalbey is about 5-foot-7, with a thick gray beard. He is wearing a light jacket over a Vancouver Aquarium t-shirt, faded jeans, low-top black Converse sneakers, and a round canvas hat with a bird pin on the brim. He opens a back door of his car and produces a pair of rubber boots and a hoe. I wanted to meet Dalbey at Big Spring this morning for two reasons. The first is that he knows perhaps more than anyone alive about what life was like along the Trinity River before John Neely Bryan showed up. Dalbey participated in a large archaeological dig in the Trinity watershed, uncovering thousands of artifacts—arrowheads, broken pieces of tools, spear points—at a site a few hundred feet from here. The findings suggest that the Trinity sustained multitudes on its banks and in the forests and upland prairies for at least 1,000 years before Bryan arrived. Dalbey wanted to expand his dig, but there was no funding or interested donors. The second reason I wanted to meet at Big Spring is that this spot, like nowhere else in the Trinity floodway, brings together so many of the ways Dallas’ ambitions for the river have ended up threatening its most valuable natural amenity. In the 1990s, nearby residents won a lawsuit they filed after an illegal trash dump in some of the old gravel pits leased by the city caught fire and burned for six months. In the 2000s, the city’s water department demolished half of McCommas Bluff, replacing it with an ugly gabion retaining wall of caged rocks. More recently, a pit dug for the construction of the mayor’s prized Trinity Forest Golf Course has come under state environmental investigation. I get out of the car, and Dalbey struggles to pull on his rubber boots. “They said they would be here at 10:30,” he says. I check my phone. It’s 10:36. The official channels, I find out, are employees with the city’s Trinity River Watershed Management Department who are supposed to come push buttons on a keypad that will open the gate to Big Spring. Dalbey, who came to Dallas from Cincinnati in the 1970s to study archaeology at SMU, was a friend of Ned Fritz’s and remains something of an elder statesman among the close-knit group of environmentally minded bird-watchers, naturalists, hikers, canoers, and general Trinity explorers and watchdogs who count themselves as Fritz’s successors. If Dalbey comes off as prickly and impatient, it’s because he has plenty of experience with the Trinity River Watershed Management Department. The city hasn’t always kept Big Spring under lock and key. In the early 1980s, the water department nearly ran a storm sewer through it. More recently, the neighboring Texas Horse Park, one component of the Trinity River Corridor Plan of 1996 that was actually built, albeit in a truncated form, had plans to eventually expand on top of Big Spring. Last year, however, thanks to efforts of Dalbey and others, including Zada and Billy Ray Pemberton, who live on land adjacent to the spring that their family purchased in the 1870s, Big Spring became the first natural feature in the history of Dallas to be granted historic status by the Landmark Commission. The designation surprised some of the most hardened local conservationists. A white pickup pulls up, and Adam Ozier, an environmental coordinator with the city, gets out to unlock the gate. Since Big Springs’ designation as a historic landmark, the city inspects it regularly. The threats are multiple: horses, wild hogs, even city employees, who have been known to unwittingly tear up or willfully destroy other supposed protected portions of the Trinity watershed. Ozier, however, appears a sincere and observant steward of the forest. As we walk through the gate, he points out some of the sights. There is a massive black walnut tree with a spike driven into the trunk to mark the height of a flood in 1954. There is a thick bur oak believed to be at least 150 years old. Ozier explains that the pecan saplings slowly filling in a clearing are part of a city-led effort to restore part of the forest that was removed when the city laid a stormwater pipe through the area in the 1980s. Then there is the spring itself. Rain that seeps through the ground uphill from the spring gets trapped between a layer of impervious, crustaceous limestone and sand and gravel that was dragged to this overlooked corner of the continent during the Sangamon interglacial age. The water that percolates through tiny vents in the rock to form a shallow pool beneath a small grove of trees fell to the earth at least 600 years ago. “Drinkable,” Dalbey says, popping up from the pool with a broad smile and capping a little bottle of crystalline water he has gathered from the spring for a lab test. Once Dalbey has finished collecting his samples, Ozier and an assistant head off to finish their reports on other corners of the 40,000-acre forest. Watching Ozier fill out his report on Big Spring, taking note of invasive plant species or signs of hogs, it couldn’t be more clear that the city lacks the necessary staff and funding to properly monitor and maintain the vast Trinity Forest and the floodway upstream even if, like Ozier, it sincerely wanted to. As with so much that surrounds the long history of the Trinity River, reality often isn’t what it seems. When the mayor announced the $10 million down payment on the Van Valkenburgh plan, the vast green backdrop of the Trinity River was, in a sense, not even the Trinity River. It was a man-made, much-diminished version of the river. The floodway between the levees is mowed and maintained by the city of Dallas, which follows a protocol set by the Corps of Engineers. The river was long ago straightened and moved from its meandering course, remnants of which you can still spot in the Design District and under a tangle of highways south of downtown. The straight ditch that we call the Trinity today runs under overpasses that were still required in the 1970s and 1980s to be built tall enough to accommodate barges below their spans. That contrast certainly helps sell the mayor’s pitch. On paper, the Van Valkenburgh plan is the most forward-thinking, environmentally conscious design for the Trinity River to date (at least a short stretch of it). It takes that artificial floodway and river channel and re-imagines it as an ecological park, creating a new meandering channel and an undulating topography designed to fill and drain with the natural rhythms of the seasons. It is, on paper and as depicted in a large model that sits on a conference table at the Trinity Trust, stunning to behold. And yet I can’t shake the feeling that there is something in the Van Valkenburgh design that feels like sailing a steamboat from the Gulf of Mexico to Dallas. The plan calls for the construction of artificial ridges, eddies, wetlands, and shallow ponds, but to ensure that the $250 million design doesn’t wash away in the next flood, some of that undulating topography will have to be reinforced, or “armored,” as a design consultant working on the project put it to me. In other words, while the Van Valkenburgh design looks like a restoration of a natural river environment, it is still an architectural strategy, an engineering feat intended to make the river do something for Dallas. Only in this case, rather than serving as a shipping canal, Dallas will make the river do a dress-up routine, spending hundreds of millions to make it prettier on its brief parade under the signature bridges. Perhaps as telling is the fact that, like all the plans of the past, what is still missing is a vision and financial plan for the conservation and maintenance of the entire Trinity River watershed. Instead, the latest plan continues a tradition of allowing private interests—from industrial corporations to well-meaning trail builders—to patch together a ragtag collection of projects and amenities with scant regard for what may or may not be appropriate for the Trinity River ecosystem. Sloan’s and Hunt’s ideas aren’t new. They belong to an alternative history of the Trinity River Project that is as old as—or older than—the city itself. They are the ideas of Ned Fritz, who helped save the river from being turned into a concrete canal. They are the ideas of the state of Texas, which had hoped to turn the Trinity watershed into a state park. They are the ideas of the National Audubon Society, which opened the Trinity River Audubon Center in 2008 and turned a dump into a restored wetland and bird sanctuary. They are the hope of the private citizens who have been exploring, watching, and protecting the Trinity River watershed for decades. You could even say they are the ideas of everyone who lived in the Trinity’s watershed before John Neely Bryan showed up. Dallas stands at the beginning of the next—perhaps last—chapter of the Trinity debate. The mayor and the usual cast of characters who have been engaged with the project for decades have another expensive dream for Dallas’ river. Hunt and Sloan are leading their own efforts to take the Trinity River Project in a new direction. What is radical about this new approach is that it is so simple. What if the reason the Trinity River Project has never materialized is because Dallas has burdened its vision with too many competing and conflicting goals? What if the reason Dallas has failed to realize its dream of turning the Trinity into a civic calling card is because it has tried to subjugate and redesign the natural wonder it already possesses? What if the best way forward is to do something Dallas has never considered? Maybe we shouldn’t do much at all and simply allow the Trinity River to follow its own course. Will Recent Rallies Affect Dallas Voter Turnout?